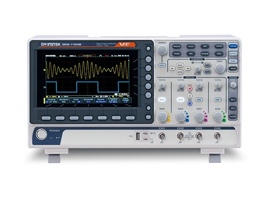 Fuseco offers wide range of oscilloscopes from GW Instek. GW Instek provides an entire series of oscilloscope solution, comprised of four groups: Digital Storage Oscilloscope, Handheld (Portable) Oscilloscope, Analog Oscilloscope, and Real Time/Digital Storage Oscilloscope. GW Instek provide a complete range of Digital Oscilloscopes which have integrated features such as Spectrum Analysers, DMM’s, Logic Analysers and Power Supplies making them a powerful instrument for monitoring and analysis of signals. Features include Mixed Domain, Mixed Signal, Serial Analysis, FFT Analysis as well as Visual Persistence Display adding to the usability of their User Interface. The frequency bandwidth ranges from the handy 50MHz to the high-class 500MHz. In addition, up to 5GSa/s real-time sampling rate and 10M points memory depth can pick up and hold the complete signal in order to preserve the accuracy. PC interfaces such as USB, LAN, GPIB, RS-232C, and Printer Port are integrated to the panel to satisfy data transmit/save needs.